Monday October 19th 1903 It was a fine day. I finished my silk wist in the morning and in the afternoon went down to Fannies to a party for Aunt Fannie. I had a nice time. Did my evening work and went to bed early. Will has Levi Hill helping him dig potatoes and fix fence. Tuesday October 20th 1903 weather fine. I was busy with the work all morning and went down to Scales to buy some Buff P. Rock chickens in afternoon. was at home awhile. Then to town to do trading and called at Flora Platers to see her Mother. came home to do evening work. Will and I caught chickens to sell after supper. It was eight years today since Charles was buried. 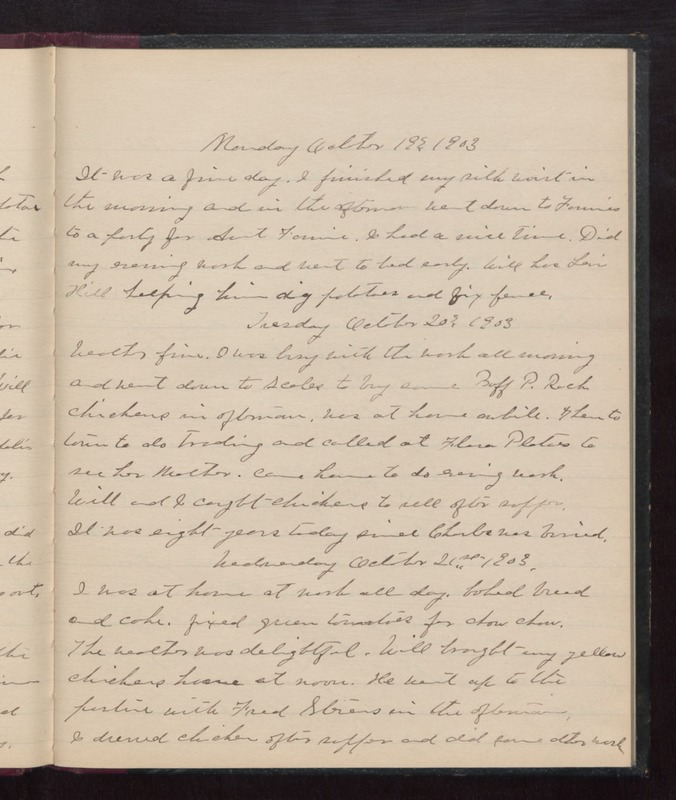 Wednesday October 21st 1903 I was at home at work all day. baked bread and cake, fixed green tomatoes for chow chow. The weather was delightful. Will brought my yellow chickens home at noon. He went up to the pasture with Fred Stevens in the afternoon. I dressed chicken after supper and did some other work.